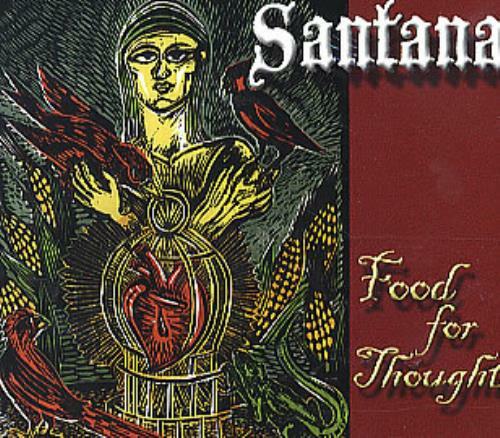 SANTANA Food For Thought (2004 US-only limited edition 10-track CD album only available from 'Baja Fresh' Mexican grill resturants for a limited time. This CD features four Santana songs, one never released Santana recording from his archives, one song recorded with and written by his son Salvador. Also includes tracks by Etta James, Buddy Guy, Indigenous & Cesaria Evora. Presented in a digipak picture sleeve & features a painting that Carlos selected from his personal art collection painted by Angel Perez, the title of the painting is Alimento de los Recuerdos 'Food For Thought'. This copy remains factory sealed from new DPC13621).